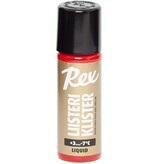 Rex Liquid Gold Klister is designed specifically for manmade snow conditions. This is perfect for the racer that needs fast skis for racing and wants to avoid the traditional klister application process. Rex Gold Klister can be paired with a covering Rex TK-1814 World Cup Racing Hard Wax for increased speed.